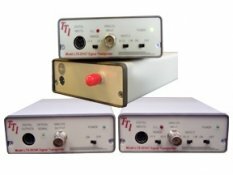 The LTX-5510 “Signal Transporter” Converter pair is designed to transmit analogue and digital signals to a remote location via fibre optic cable. This product digitizes the input signals at 50 Ms/s to 12-bit precision, transmits the results over a 1.0 Gb/s fibre link and reconstructs the signal at the far end. The main applications are those situations in which the signal of interest has a high common mode voltage with respect to the measurement equipment. Applications include data acquisition for plasma physics experiments, signal transmission and control of equipment at high voltage potentials, transmission of high quality video, and precise noise-free signal transmission in hostile EMI environments.